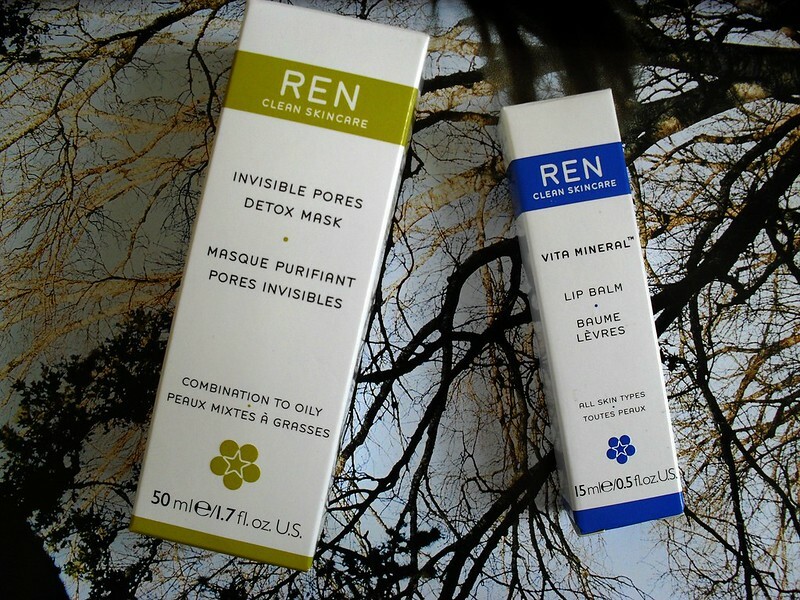 I was very impressed by my first foray into REN Skincare, I've previously used the Glycolactic Radiance Renewal Mask and the Radiance Perfection Serum and I loved both of them but my skin has become more oily recently so I was looking for a mask that would mattify my skin and reduce the size of my pores. I decided to try out the Invisible Pores Detox Mask and I got the Vita Mineral Lip Balm at the same time. I've been using them for the past month and I'm so impressed with both products. The mask is suggested for combination to oily skin which is my skin type. It's a clay based mask so it's supposed to dry out any impurities and excess oil and eliminate dead skin cells . The other natural ingredients are meant to encourage cell renewal and restructure of the skin and leave skin soft and smooth with less visible imperfections. I use this once a week and I've found the mask did what it claimed it would, it gave my skin an overall clear, fresh and toned appearance and it has also helped to control the excess oil on my T-zone. It also didn't feel drying or tight like other clay based masks I've used in the past. I'll definitely be repurchasing this. You can buy it from €22-28 from sites like Look Fantastic, Cloud 10 Beauty and in Space NK and Marks and Spencers. The next REN product I want to tell you about is the Vita Mineral Lip Balm. I bought this on a whim after running out of my Caudalie Lip Conditioner and I've been using it non stop since. I love that it comes in a tube so you can squeeze the balm out as needed and apply it with fingers or with the applicator, I prefer the latter as it's more hygienic when you're out and about. The texture is silky and smooth with a more glossy finish than I'm used to from a lip balm but it makes it perfect for those days where you want to give your lips a break from lipstick but still want them to look nice. As you can see below the lip balm has an impressive list of ingredients. The Acacia honey has anti- bacterial properties. Vitamin E is an anti-oxidant that protects and repairs the skin and Shea Butter soothes and moisturises the lips. I had never heard of Calendula oil before so I did some research and apparently it is derived from Marigold flowers and is a powerful anti- inflammatory, anti- bacterial and antiseptic. It seems to have countless uses and benefits so definitely a skincare ingredient to look our for if you like natural products. The lip balm is priced between €11-12 and can be bought in the same stockists as above. One of the things I love about REN is that their products contain 100% naturally derived plant and mineral ingredients and are free from synthetic ingredients like sulphates, paragons and silicones. All of the products smell amazing which is an added bonus and makes the products even more of a pleasure to use. The other thing that attracts me to REN is their beautiful minimalist packaging, each range is colour coded too which is a nice touch. Have you tried REN yet? Do you use any other natural skincare brands? PS. I was at a REN press event yesterday for a very exciting new product launching in September. I tried it for the first time today and will be letting you know my thoughts closer to the launch date. Both of those products sound amazing! Thank you for taking the time to leave a comment. I appreciate every single one! All Content including Photographs Copyright Emma Grimes Ol' Green Eyes except where stated. If you want me to remove any content that is not my own or have any problems with anything on my blog please contact me on the above email address. All Materials Copyright Emma Grimes 2017 Except Where Stated Otherwise. Simple theme. Powered by Blogger.